Choose the size you would like & we will make it. Choose from our range of fabrics & fillings for your inner & cover. Send us your information for a free no hassle quotation. 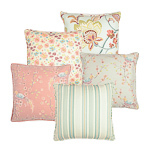 Add the finishing touch to your home with our range of beautifully crafted cushions. Browse through and find the right design to add both comfort and style to your rooms with our fresh colours, patterns and tones. We are proud to present own range of designer cushion collections. From plain cottons, bold patterns and stripes to calming warm tones and luxury linen fabrics, there's a style to suite every interior and taste. 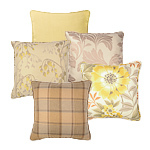 Our cushions are designed in house, handmade by our skilled crafts team and updated seasonally. Young, fresh, designs using soft pastel colours are pleasing to the eye and will revitalise any room.